The Hilltop Lodge is the perfect place to make some memories, have a reunion, vacation, or get together with friends or family. The Lodge has WiFi, air conditioning, a large yard, yard games such as horseshoes and bean bag games, and a private pond and stream running through your property. Relax in the outdoor Hot tub and enjoy the spectacular view, or grill on the deck while watching the sunset over the mountains! 15 minutes from Deadwood and near many attractions such as Mt. Rushmore, Lakes, fishing, golf course, biking, hiking, snow skiing or boarding, and snowmobiling. 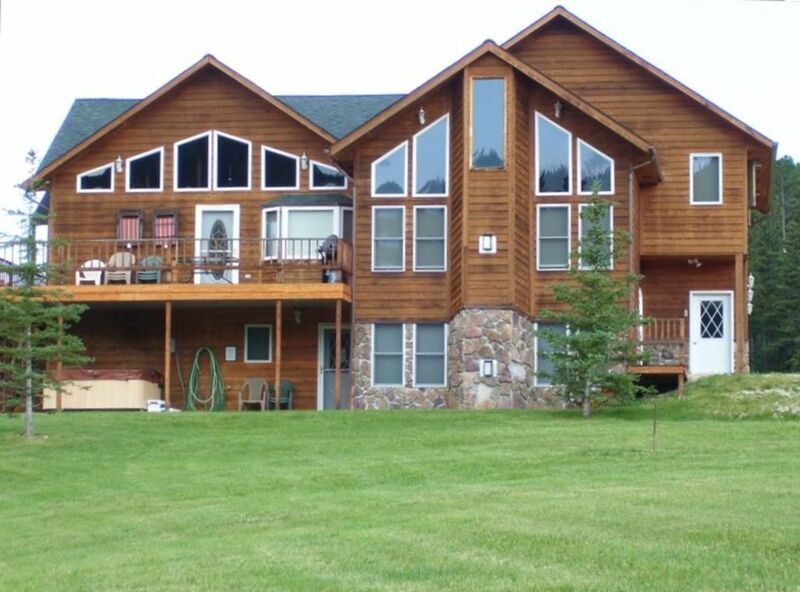 The Hilltop Lodge is right on the snowmobiling trail, so you can sled right from your home. Wildlife such as deer and wild turkeys abound. The Hilltop Lodge is modern, spacious, and fully furnished for your comfort! Available year round. We built the Hilltop home on 3 acres of land, with a breathtaking view. It has a pond on the property, and lots of room for yard games or just plain relaxing. Enjoying time in the Black Hills has always been our family vacation. In floor heating through out. Plenty of parking with extra parking upon request. Fully furnished kitchen with grill, crock pot, coffee pot, toaster, electric can opener, microwave, electric fry pan, plenty of pots and pans and dishes. Large yard with horseshoe game and bean bag games available. Terry Peak is 15 minutes away. My family of 4 and I stayed for a long weekend of snowmobiling. The house was easy to find with a great location close to the trail system so we could ride from the house without having to trailer out. The house was well equiped with everything we needed tomake some of our own meals and enjoy the stay. We even had cell reception which many others weve stayed in the area dont so thats a nice piece of mind. We all enjoyed our stay and would highly recomend this property to anyone. Well taken care of . Perfect . Had a great time at Hill Top Lodge. The Grandkids had a blast , outside most of day . Traveled around the area everyday checking everything out. Would recommend Hill Top for a place in the Hills. Everybody at the house enjoyed it. The views were great and we loved the location. We loved driving the 6 miles to Cheyenne Crossing and eating there. We then went the 4 miles to Roughlock Falls. The house was in excellent condition. The deck curled around the house so no matter what time of day you will be able to get into the sun or out of the sun whatever your preference. There were ample deck chairs, dishes, blankets, pillows. There is a horseshoe pit and sand bag toss game in the yard. The kids had a blast running down to the little pond and stream just down the hill from the house. There are 3 or 4 very comfortable recliners which were used quite a bit. The pool table was in good shape and the kids enjoyed the hot tub. The owner was contacted several times during the process of renting and moving in and she was always pleasant, friendly and helpful. 1. The deck has a large space below the fence where a toddler could tumble right off of it. We had a 2 year old we kept in the house or in mama's arms if outside just to keep him away from the railing. 2. No air conditioning. This was not a problem as we were able to open the windows and set up fans and it was very comfortable. 3. The screen doors had a lot of resistance and it was difficult for people with drinks or food in hand or for children to go in and out of house without door coming back hard on you. 4. The TV channels were very basic cable so you might want to bring DVDs. The TVs did have USB ports in the back. Again these are all minor issues we experienced and outside of the Master bedroom not having a TV did not affect our enjoyment during our stay. We will definitely look at this property again next year for our reunion. Great place. Location and the view from the decks second to none. Clean, comfortable with things like towels, soap, laundry detergent, coffee and spices in abundance. I will say we ran low on toilet paper though! The driveway is interesting via motorcycle but being talented individuals not a problem. The garage was fabulous and roomy! Only hiccup besides the TP shortage was the wrong garage code upon arrival. Good thing it wasn't raining. A text message eventually got us the right code and in. We loved it and appreciated the owners very much in our corresponence with them.